Having spied the piano in the corner of the social room at the Scottish Rite Cathedral, Dr. Canes Nicolas makes a beeline for it to identify the manufacturer. It’s a Conover–a model that Missouri Southern’s new assistant professor of music isn’t familiar with. “I have to try this,” he says, sitting down at the small bench and improvising a classical-sounding tune. Something isn’t right, however. The notes have a muffled quality. Nicolas stands in order to carefully inspect the piano, quickly discovering that the top of the instrument opens, revealing a hidden stand for sheet music. Now open, music from the piano quickly fills the room with rich tones. It’s a moment of discovery for the Haiti native, who comes to Missouri Southern from Southern Utah University–and discovery is what this day is all about. 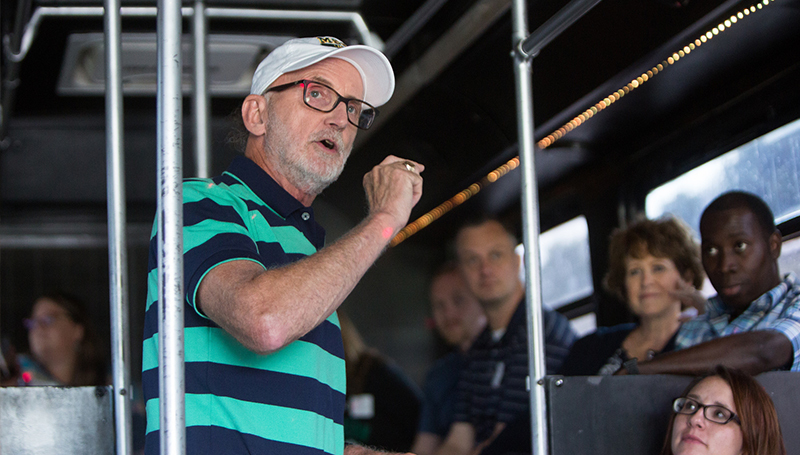 Nearly all of the university’s 30 new faculty members gathered for the afternoon a week before the start of the fall semester for a tour of Joplin – a first-ever event designed to give new arrivals a chance to get acquainted with the community, its history and locations of interest. Following lunch at Instant Karma Gourmet Hot Dogs in downtown Joplin, the group took a walking tour of the downtown area. Stops included the former Fox Theater – now home to Central Christian Center, where they were welcomed by Mayor Gary Shaw – the Newman Building, the former Joplin Public Library, and the Scottish Rite Cathedral. The new faculty members then boarded a bus for destinations including the Joplin Museum Complex, the new KCU medical school, the tornado memorial in Cunningham Park and a brief hike along a bluff near Wildcat Park to visit Mother Nature’s Crack. The tour ended with a stop at the garage apartment where Bonnie and Clyde’s gang briefly hid and had a shootout with officers from the Joplin Police Department. Dr. Jordan Baumbach, an Iowa native who joined the biology and environmental health faculty as an assistant professor, says she enjoyed learning about the city’s mining heritage. Dr. Kyle Gustafson, who comes to Missouri Southern from the University of Wyoming, is among those who took time to learn more about the deadly May 22, 2011 Tornado during the visit to the memorial area in Cunningham Park. Brad Belk, Missouri Southern’s community historian, offered perspective on each location’s significance along the way. The tour is a way to “step it up” in how new faculty members are welcomed to campus, says Dr. Wendy McGrane, Associate Vice President for Academic Affairs and Vice Provost.